As regular visitors to this space know, I’ve long been of the opinion that if jazz is going to be relevant in the future, many traditionalists must make peace with the hip-hop and R&B influences that many of today’s most gifted young musicians come from. Most of these young cats respect the “tradition” but they didn’t grow up with Tin Pan Alley in their ears. What they bring to the table is often fresh and quite creative. We will see a lot of that on display on Saturday, May 23 at the 38th Atlanta Jazz Festival Main Stage. It will open at 1 PM with Daniel D., a popular contemporary jazz violinist who plays a lot of Hip Hop and R&B chart hits. He will be followed at 3PM by The Rad Trads ,an energetic horn powered group based out of NYC. They specialize in an up-tempo mix of R&B, New Orleans Jazz and funk. Their fun stage shows have garnered them a ton of recent buzz. But the big draw for me will begin at 5 PM, as REVIVE – an online music hub and concert promotion team, which specializes in the fusion of classic styles, such as jazz, with today’s ideas and genres – joins forces with Blue Note Records, that most venerable of jazz labels, to present an evening of true modern jazz. Featured will be three of the new generation of Blue Note artists, who will bring us jazz, from their perspective of “the mainstream”. Marcus Strickland has collaborated and recorded with an impressive list of musicians, including Wynton Marsalis, Tom Harrell, Dave Douglas, and Jeff “Tain” Watts. But one of Strickland’s longest musical collaborations is his most impressive one, as Mr. Strickland was asked while still in college, to join legendary drummer Roy Haynes’ Fountain of Youth band. He played tenor sax with Haynes for five fruitful years. He has also garnered some major awards from the jazz press, having won the Rising Star on Soprano Saxophone in Downbeat’s 2012 Critic’s Poll; Rising Star on Tenor Saxophone in Downbeat’s 2010 Critic’s Poll; Rising Star on Soprano Saxophone in Downbeat’s 2008 Critic’s Poll and Best New Artist in JazzTimes’ 2006 Reader’s Poll. His 2011 double CD set Triumph of the Heavy – Vol. 1 & 2, was one of our selections for Best Jazz Album of 2011. In addition to his acclaimed acoustic jazz work, Marcus Strickland has also been heavily involved with Twi-Life, an electric band with its inception rooted in the soul music Strickland grew up listening to. Mr. Strickland has said that he tries to keep the personnel in Twi-Life fluid, so that the ideas and creativity will remain fresh. The current members of the group have worked have worked individually with artists like Kanye West, & Bilal. They include keyboardist Yuki Hirano; bassist Mark Kelley who is also a member of The Roots; drummer Charles Haynes; and on vocals Jean Baylor, who some of us will remember from the 90s R&B duo, Zhané (“Hey Mr. D.J.”; “Groove Thang”). Expect great things Saturday as Strickland and Twi-Life, bring together the improvisation of acoustic jazz and instrumentation with the rhythms that have made much of today’s music so popular. Otis Brown III is one of the busiest young drummers in jazz today. The son of musicians and music educators, Brown grew up to the sounds of jazz, gospel, funk and rhythm and blues. His father, a jazz band instructor, played with James Brown and Al Green. His mother, an educator who also served as principal at Newark’s Arts High School (alma mater to jazz greats Sarah Vaughan and Wayne Shorter), was also a choir director and classically trained pianist. After playing saxophone and drums in school and church, Mr. Brown attended Delaware State University as music major, where he met the great trumpeter Donald Byrd who advised young Otis to go to NYC and dive headlong into the jazz scene. Brown did and he soon caught the attention of Joe Lovano. After initially subbing for Lewis Nash and the late Idris Muhammad in Lovano’s band, Brown became a member of Lovano’s Us Five quintet, where he developed a strong musical kinship with the group’s bassist, Esperanza Spalding, who then asked Brown to join her band as well. Brown has also worked with Terence Blanchard, Oliver Lake and the vocalist, Somi, among others. Last year, Otis Brown III released his first album as a leader, The Thought of You, on Revive/Blue Note Records. With support from such kindred musical spirits as Robert Glasper, trumpeter Keyon Harrold, bassist Ben Williams and vocalists Gretchen Parlato and Bilal and production by Derrick Hodge, the album is a shining example of some of the best work that the new breed of new jazz artists has to offer. It featured edgy improvisations, tunes that were unafraid to stretch boundaries and rhythms that were refreshingly contemporary. It stayed on regular rotation in my iPod from its release throughout the rest of 2014. It was also one of my Best Jazz Albums of last year. We’re looking forward to hearing Mr. Brown deliver the goods, with tracks from The Thought of You and more. Closing out the second night of AJF38 will be Derrick Hodge. Another of Blue Note’s group of “New Jack Jazz” artists, Hodge has appeared previously on the Atlanta Jazz Festival stage in 2012 in one of his other roles, as bassist in the Robert Glasper Experiment. As usual with jazz musicians of his age and talents, Mr. Hodge has played with a diverse array of artists including Terence Blanchard, Jill Scott, Maxwell and the late Mulgrew Miller. He has also released a well received Blue Note album of his own, 2013’s Live Today, (a CurtJazz.com Best Jazz Albums of 2013 selection) which featured appearances by Glasper, hip hop superstar Common, Marcus Strickland, pianist Aaron Parks and turntable artist Jahi Sundance. 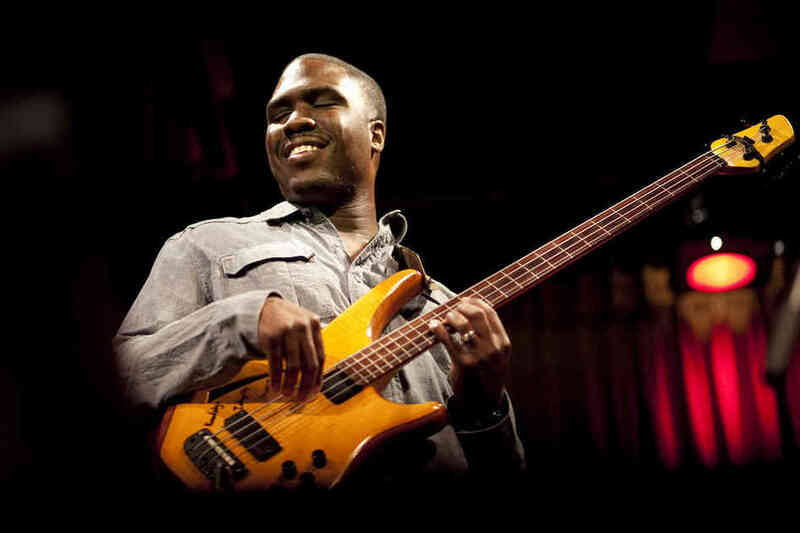 Like the recent work of Mr. Glasper, Mr. Brown and Marcus Strickland, Hodge is clearly looking to all of his various influences on Live Today and he’s also taking advantage of many of the possibilities that our digital age affords him. One of the album’s tracks, “Table Jawn”, includes sounds recorded on Hodge’s wife’s iPhone as Hodge, Glasper and drummer Chris Dave, were sitting at Hodge’s kitchen table. One person grabbed a spoon, another a cup and then they began to beat out a rhythm which Mrs. Hodge recorded and it was then used as the basis of the tune. While we don’t expect any cutlery or place setting items to be directly used in the making of music on Saturday night, there’s likely to be a similar dose of creativity. The type of music that I’ve often called “the future of jazz” will be on display in full glory all throughout the day on the AJF38 Main Stage, thanks to REVIVE and Blue Note Records. So, to quote the late actor, Ted Ross as he closed out an old Heath Brothers live album “May the rest of the populace be sophisticated enough to dig it”. Tracks from all of these and other AJF 38 artists will be playing daily from 5 PM – 7 PM (ET) on our 24/7 streaming jazz station Curt’s Café Noir, until May 31. Click HERE to access the station.